A new chapter opens in the case involving Msgr. Franco Mulakkal, on trial for sexual violence. The Missionary Sisters of Jesus had received a transfer order from the mother superior of the congregation. They do not want to leave the nun who has accused the bishop alone and they fear the sabotage of the trials. Mumbai (AsiaNews) - The five Missionary Sisters of Jesus in Kerala who are defending their sister who claims to have been raped by Msgr. Franco Mulakkal, will remain close to the victim until the conclusion of the trial. This was ensured by a letter from Msgr. Agnelo Gracias, auxiliary bishop emeritus of Mumbai who since last September is also the apostolic administrator of the diocese of Jalandhar (in Punjab), after Pope Francis accepted the temporary resignation of Bishop Mulakkal, implicated in the case of sexual violence against the religious . The missive of the apostolic administrator represents the first explicit position of the ecclesiastical superiors in favor of the sisters. 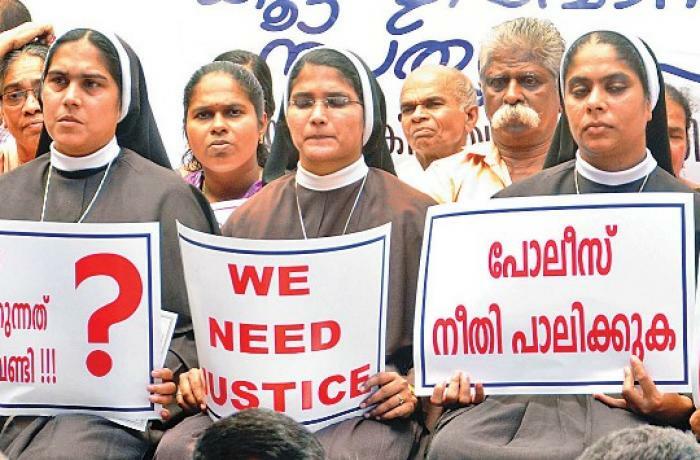 The case of the nun raped by Bishop Mulakkal has upset the Indian Church. The religious, former superior of the Missionaries of Jesus, in September 2018 denounced the prelate for multiple acts of violence committed between 2014 and 2016 in a convent in Kuravilangad, in Kottayam (Kerala). At first unheard, her accusation gained the attention of the national and international press when five sisters organized a public protest, supported by several Catholic figures (one of them died in mysterious circumstances). After those protests, however, the nuns received transfer orders from their nnew superior to other convents, while they would like to remain in Kottayam to support the victim. In fact, they fear that, by going away, the bishop's supporters would have a free hand to sabotage the evidence. Mons. Gracias welcomes the requests of the sisters and writes: "I want to assure you five that, for what is in my power, from the diocese of Jalandhar there will be no action to drive you from the convent of Kuravingalad, as long as [your testimony] is needed in the judicial process ". "The truth - added the temporary administrator - will emerge when all the evidence is presented. I am sure that the Church wants truth to emerge ". After the bishop's announcement, the nuns decided to suspend another wave of protests they had announced for the next few days. In fact to complicate the affair, there is a note of Fr. Peter Kavumpuram, spokesman of the diocese of Jalandhar, which seems to disprove what has been stated by the new administrator. In fact, he defends the mother superior and says that hers was not a "transfer" order, but "rather an invitation to return to their righteous communities from which [the nuns] had left without permission." Therefore the order of the congregation "is not canceled, but suspended".